Bringing together bicycling's top academic professionals, Bikes Belong held an unprecedented Bicycling Research Symposium in Boulder, CO., on May 1, 2009. With 11 researchers in attendance from such diverse fields as urban planning, architecture, public health, civil engineering, environmental science, and public policy, the symposium provided a rare meeting of the minds to share ideas about the relationship between bike advocacy and research. The university-based researchers who participated were Chandra Bhat, University of Texas at Austin; Ralph Buehler, Virginia Tech; Kelly Clifton, University of Maryland; Jennifer Dill, Portland State University; Peter Furth, Northeastern University; Susan Handy, University of California at Davis; Kevin Krizek, University of Colorado; Nico Larco, University of Oregon; Anne Lusk, Harvard School of Public Health; Noreen McDonald, University of North Carolina; and Marc Schlossberg, University of Oregon. Special guests also included Thomas Gotschi, the director of research for the Rails-to-Trails Conservancy, and Hillie Talens, project manager for the Dutch national Information and Technology Centre for Transport and Infrastructure, CROW, whose core tasks involve research and standardization of traffic, transport and infrastructure in the Netherlands. 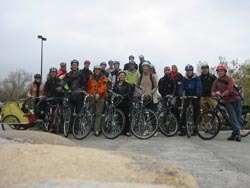 "This event achieved three important goals," said Tim Blumenthal, executive director of Bikes Belong. "It helped improve communication among researchers who study bicycling, it pinpointed key topics that warrant additional research, and it gave everyone a better sense of what bicycling advocates need to make the case for additional government funding." The symposium attendees rated the current state of bicycling research in a number of areas including economic impacts, health benefits, safety, influences on road congestion and more. The average ranking for these areas of research was a D+. Demographics research received the highest score; children's bicycling received the lowest mark. Bikes Belong believes the quality and quantity of bicycling research will continue to be a key factor in convincing Congress and other key politicians and community leaders about the benefits of bicycling. These performance-based facts and outcomes will be especially important in determining bike program funding in the impending renewal of the federal transportation bill. Bikes Belong hopes to reconvene the group annually to foster a steady dialogue between the research and advocacy sides of bicycling.